Trump Wants To End Citizenship By Birth. Can He? Donald Trump has made clear throughout his campaign and administration that he has no respect for the conventional norms of United States government. From his calamitous attempt, just after his inauguration, to institute a travel ban for several countries with predominantly Muslim populations to his equally uproarious attempt last summer to ban transgender people from the U.S. military by way of a tweet, he has continually pushed the limits of what the president can get away with. The courts have stopped some of these attempts to rule by fiat (though the travel ban is very much in effect as of now). But court injunctions haven’t stopped Trump from trying… and his latest attempt might be his most blatantly dictatorial power grab yet. In an interview with HBO news show Axios, scheduled to air next Sunday, Trump tells the show’s hosts that he’s interested in ending the Constitution’s guarantee of citizenship to anyone born within the United States. The interviewer tells Trump about how some legal scholars think this 14th Amendment policy can be ended by Executive Order, a legal directive that can be signed into law by the president without approval from Congress. In truth, the United States is one of 35 countries that allows for unrestricted citizenship by birth; others include Canada, Mexico, and Brazil. Significantly, all but three of these countries are in the Western Hemisphere; birthright citizenship doesn’t exist anywhere in Europe. In the US, citizenship by birth is guranteed by the 14th Amendment, one of three amendments to the U.S. Constitution signed into law after the end of the Civil War. The 14th Amendment’s roots lie in one of the Supreme Court’s most infamous moments, the Dred Scott decision. In this 1857 ruling, the Court said that Dred Scott, a slave who’d been taken to free states on multiple occasions by his captors, was subject to the control of his slavemasters regardless of the laws in the state he entered. They based this ruling on the notion that slaves, regardless of where they were born, were not citizens of the United States, due to the fact of their enslavement. The 14th Amendment’s Citizenship Clause reversed this decision. “All persons born or naturalized in the United States, and subject to the jurisdiction thereof, are citizens of the United States and of the State wherein they reside,” it read. That “subject to the jurisdiction thereof” phrase has generated some controversy over the years, but according to constitutional law professor Suzanna Sherry, it’s pretty straightforward. “That means that they are subject to the laws of the United States; that they can, for example, be prosecuted for violating American law,” she told NPR. In addition to being an attempt to make amends with former slaves, this clause also served to make immigrants feel more welcome in the US. In the late 19th century, immigration was vital to the United States workforce. These days, children of immigrants are seen quite differently. The growth of undocumented immigration to the United States from Latin American countries, which increased steadily throughout the late 90s and early 2000s, stoked right-wing fears — most of which were both unfounded and racist. By 2006, the term “anchor baby” had become ubiquitous on the right as a pejorative reference to US-born children of undocumented immigrants, who obtained citizenship at birth despite their parents coming to the country outside the legal immigration process. The push to repeal the 14th Amendment’s Citizenship Clause and end citizenship by birth grew out of this (racist and hateful) right-wing movement, and as the US president with the most direct connection to that movement thus far, Trump is certainly in tune with it. However, his belief that an executive order alone would be enough to repeal a constitutional amendment is not supported by most scholars. Earlier this year, retired Supreme Court Justice John Paul Stevens, who served on the Court from 1975 until 2010, published an op-ed in the New York Times, calling for a repeal of the Second Amendment and its provision of unrestricted access to firearms. Stevens felt that the Supreme Court’s decision in the 2008 District of Columbia v. Heller case was wrong, and should be overturned by way of amending the Constitution. “Overturning that decision via a constitutional amendment to get rid of the Second Amendment would be simple,” Stevens wrote. This kind of amendment is not unprecedented; the 18th Amendment, which prohibited manufacture or sale of alcohol in the United States, was later overturned by the 21st Amendment. However, it required not only a two-thirds majority vote in favor of passage by both houses of Congress, but passage by three-fourths of the country’s 50 states. The fact that this has only happened once in the 240-year history of the United States shows how difficult it is to accomplish. If Stevens had seen an easier path to repealing the Second Amendment, surely he would have proposed it. As a former Supreme Court Justice himself, one would think he’s more aware than most of exactly what the Constitution allows and forbids. It seems likely that the Supreme Court, complete with brand-new Trump appointee Brett Kavanaugh on board, will ultimately be the ones who decide whether Donald Trump should have line-item veto power over the Constitution of the United States. If the court were to rule in Trump’s favor, this would all but abolish, in real terms, the tripartite system of checks and balances we all learned about in middle-school social studies classes — paving the way for Trump’s joke(?) about being president for life to become a horrifying reality. Today’s print edition of the Richmond Times-Dispatch features an editorial cartoon mocking the separation of families at the southern border, and I am utterly outraged. Unless you think the forced separation of children from their parents is somehow acceptable, featuring this cartoon is absolutely disgraceful. 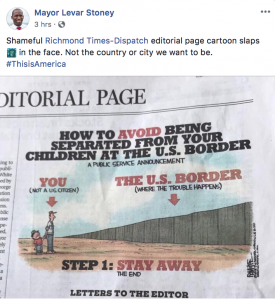 The audacity of Richmond’s major newspaper to publish a cartoon poking fun at a situation, which has seen over 2,300 children removed from their parents, diminishes the very real pain of these families and attempts to normalize inhumane “zero tolerance” immigration policies. Showing a cartoon as low as this one is not only a blow to the immigrant persona, but is also an attempt to “other” the experience of immigrants who are seeking asylum from violence. The cartoon suggests to families attempting to cross the border one piece of advice that might ultimately “solve” this crisis; “Step 1: Stay Away” and underneath it, reads, “The End.” To suggest that a crisis as major as this one could be solved by a two-word, eight-letter proposition is a pitiful oversimplification of a very serious, complex problem. The most ironic part? I wonder how many refugees and illegal immigrants wouldn’t have to flee their countries if the U.S. hadn’t destabilized nations by propping up right-wing dictators in favor of U.S. interests; for example, U.S.-backed Guatemalan President Jacob Árbenz and the Somoza dictatorship in Nicaragua. I am ashamed that something so ignorant and racist would be published in a newspaper associated with my city; a city that claims to be progressive. Let’s get one thing straight here: this cartoon is not “balance.” This cartoon is xenophobic, shameful, and pathetic. It renders the situation of these immigrant families as invalid and oversimplified. What is there to joke about when thousands of immigrant children are being ripped from their families and left to live in cages? Placing ridicule on children who have lost their parents and been forced apart from their families by this country’s administration is absolutely horrifying. 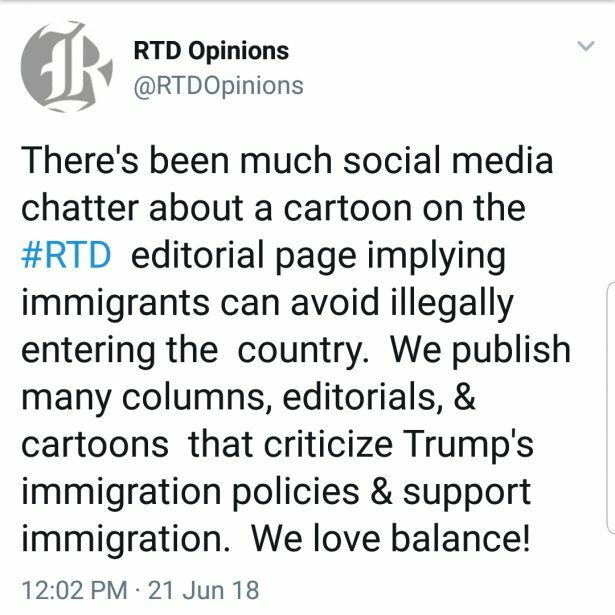 The United States of America has been at the forefront of traumatizing tens of thousands of immigrant children crossing the border and part of RTD’s response is a cartoon mocking them? This cartoon was published in the editorial section of the Richmond Times-Dispatch, which I acknowledge is a separate entity from the paper as a whole. However, publishing this content in print shows a serious lack of judgment and a tone deafness we have come to expect from RTD. Our nation is housing children in converted Walmarts and letting them sleep in cages with foil blankets. There are recordings of young children crying for their parents from tent camps. Absolutely nothing is funny about this crisis. And to ridicule thousands of families fleeing horrifying circumstances is cruel and uncalled for. I am disappointed, frustrated, and downright insulted that this content would ever be published in Richmond’s newspaper. It is impossible to say the illustrator of this cartoon has any idea what compassion or true American ideals are. The US consistently prides itself on equality, justice, and acceptance, but when its citizens see no problem mocking suffering children, is it really our place to take pride in those ideals anymore? “In high school I told my counselor I was undocumented and I remember he told me ‘students like you don’t go to college,’” said Giancarla Rojas in a meeting to help fight the student debt crisis many face here in Virginia.